Digital Inspiration is now available in 12 different languages courtesy real time machine translation from Babel Fish. Why did I switch from World Lingo to Babelfish ? How did I add WorldLingo style Translation flags ? How do I change the default look & feel of the website translation interface ?? All this and more answered below. I have even provided the code that you can copy/paste in your website or blog. A DI reader today alerted me that language translation flags embedded with WorldLingo Translation code on my website are not working anymore. Looks like WorldLingo has changed their online translation interface - so it's time for me to switch to another translation service. Yahoo recently launched the Altavista Babel Fish Translator rebranded as Yahoo Babelfish - Since Yahoo's translation service uses Systran technology that powers Google Translate, Altavista, AOL and Terra Lycos translations, I decided to give it a try - The 13 country flags that you note at the bottom of the post will translate this page in your native language using the Babel Translator with just one click. Before I get into the details, just a quick note - Yahoo Translations Tools have been around for a while but they came in the limelight only when Yahoo bought AltaVista with their baby Babelfish. Now Yahoo has integrated translation in their toolbar and added support for more languages including Greek, Dutch and Japanese, as well as simplified and traditional Chinese. Babel Fish was originally a creation of AltaVista which was purchased by Overture, which was in turn purchased by Yahoo. 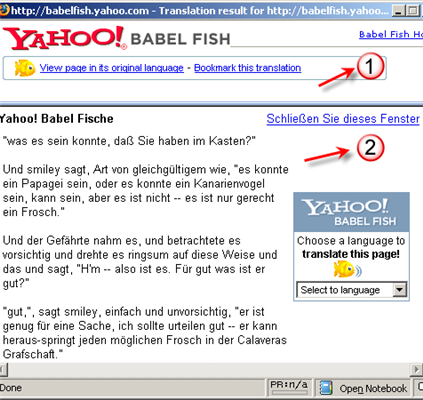 How to add Yahoo Babel fish Translation to my website ? Just copy/paste the following HTML code - It creates a 400px wide table with 13 flags - when clicked, these flags translate the current page in the native language of the visitor. Here are possible substitutions for various blogging platforms. Arabic, Hindi, Tamil, Farsi, Urdu, etc aren't suported by Systran though Google Translate can convert English pages to Arabic - I'll discuss that in my next article.